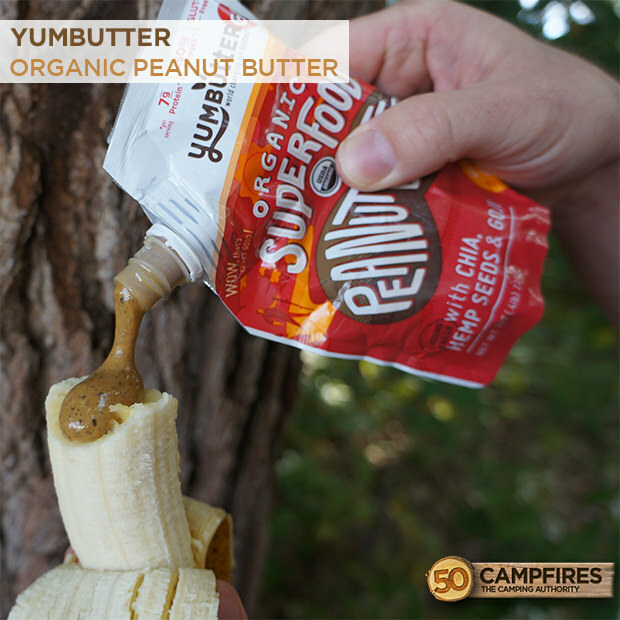 Summary : Yumbutter is delicious, good for you and comes in a really handy to-go package for any outdoor enthusiast. 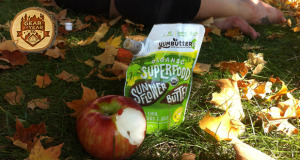 With a motto like “world changing butters” you know you’re in for a treat when you break open a package of Yumbutter. Making organic, tasty and nutritious nut butters, Yumbutter has been changing the game with portable packaging to take with you on the go. 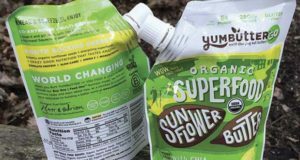 The Yumbutter Organic Peanut Butter has been one of their flagship products but has seen additions with new flavors such as cran-coco and thai peanut butter. Appearance: We all know what peanut butter looks like, but the Yumbutter organic peanut butters kick it up a notch with a little extra creaminess and the addition of chia, hemp seeds and goji. The consistency of the peanut butter is smooth and easy to spread. 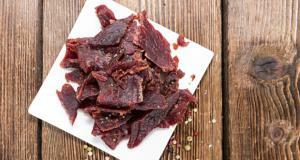 We would recommend to really mix it up in the package as it can come out a tad liquidy. Being innovative is something that Yumbutter takes seriously and you can see that in the unique packaging. We’re sure they are not the first to use the to-go pouch but they certainly have perfected it. The 7 oz to-go pouch has a screw off top that allows you to easily spread the peanut butter on and keep moving on your hike, bike ride or walk. Ease Of Use: It really doesn’t get any easier than this to have peanut butter on the go. Just throw the package in your pack and head out, when you’re ready for a snack just screw open the top and squeeze out peanut butter. Bam. You’re ready to keep moving. Taste: Being small batch, organic peanut butter you can really tell the difference in quality. The addition of the chia, hemp seeds and goji actually do give this peanut butter a distinct taste. It is certainly good all by itself, but we’ve found that we really enjoy it on bananas, apples and toast. The creaminess of the peanut butter gives it a very smooth texture, even a little lighter, less sticky than your average peanut butter. 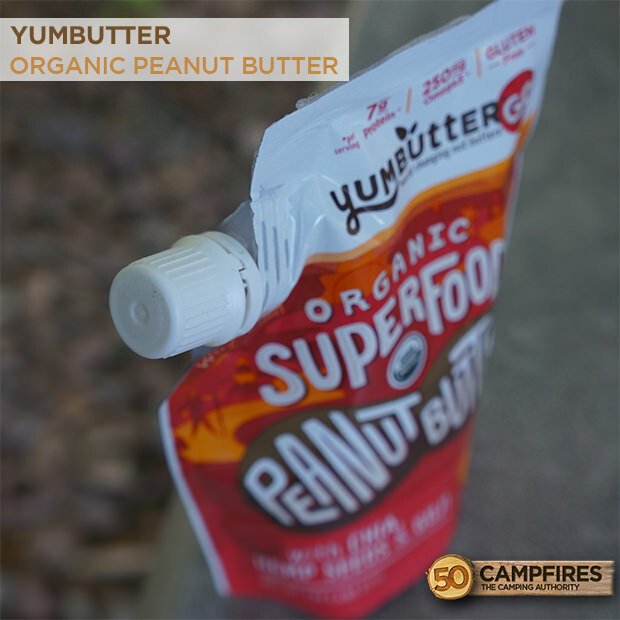 Who It Is Good For: Yumbutter Organic Peanut Butter is great for anyone on the go. Especially parents and outdoor enthusiasts. If you were to hand your 4 year old a jar of peanut butter and a spoon, there hair would never be the same again. But you hand them the Yumbutter pouch and they can easily squeeze out their own peanut butter. The same ease of use goes for anyone spending time outdoors whether you’re hitting the trail all day or just hanging out by the beach being able to easily grab a snack and continue on with your day is a huge asset. 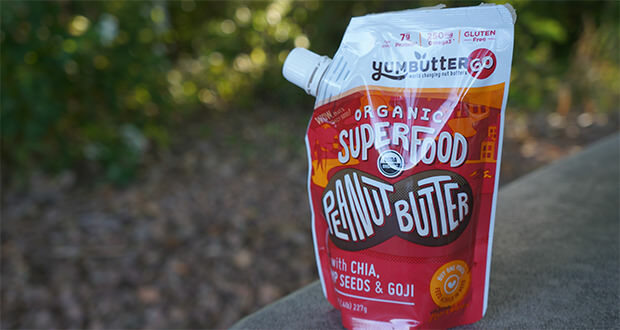 Value: Yumbutter Organic Peanut Butter is $6.99 for a 7 ounce pouch. Yes that is more expensive than your average jar of peanut butter but the convenience of Yumbutter makes the price point totally worth it. From having in your house for your kids to easily use to hitting the trails and using it as a quick snack, Yumbutter really is a world changing nut butter experience.